"I believe in history. You can't know where you're going, unless you know where you've been." Born to AA and Marion (Smith) DeChandt on November 26, 1940 in Mandan, Tony grew up with his sister Frances and brothers Thomas and Robert. His parents operated the Owl Club in Mandan. His middle name, Eastman, was given to him in honor of the doctor who delivered him. He attended St. Joseph's Grade School and Mandan High School, graduating in the class of 1958. As a young boy, he loved to play baseball and golf. His first job was caddying at the Mandan Municipal Golf Course. 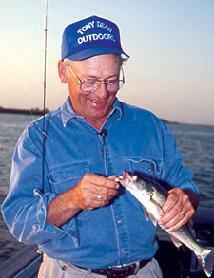 The activities that had the greatest impact on his life were hunting and fishing and all things done outdoors. 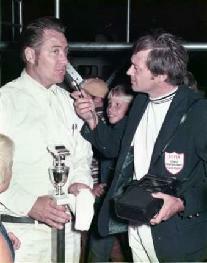 To supplement income from his radio job, he spent summer nights announcing stock car races on the dirt tracks of Iowa and Illinois. Later moving on to become a regular announcer for the Motor Racing Network covering NASCAR races on the super speedways across the south. Outdoors remained his first love. Moving to Pierre, SD in 1968 to manage a radio station, he had returned to the fishing and hunding mecca of the Dakotas. Two years later, his employer wanted him to move back to Iowa. Instead, he resigned in order to remain in Pierre. Fortune struck that same day when the Governor of South Dakota called to offer him the position as the first Gubernatorial Press Secretary in state history. But while in the Governor's office, he presented an idea to the SD Game, Fish & Parks Department to develop a radio show. That show, South Dakota Outdoors, aired daily on every station in South Dakota for the nest 25 years. In 1990, he resigned to create a new show, "Dakota Backroads," which airs 42 times daily on 29 North Dakota, South Dakota, Minnesota and one Wyoming station. He was also hired by Fisherman magazine to produce a radion show that became the largest daily program in history. He recounts that shortly after he began doing radio shows and writing a few magazine articles, his mother asked him how he made a living. He explained he hunted, fished, and wrote and talked about it. "And they paid you for that?" she asked. He assured her they did, and then she'd say, "No, c'mon, what do you really do?" It was years before she apparently accepted her oldest son was actually making a living doing something others got to do only on weekends. He has also written two books on fishing and co-authored a third, "Walleye Wisdom" with Al Lindner and the In Fisherman magazine staff. Tony Dean Outdoors, which he started in 1985, has won more outdoor programming awards than any other TV show in America. He thanks his parents for much of who he has become. From his Mom, he attributes his love of water and fishing. From his Dad, he inherited a love for autumn and hunting. He remembers his father emphasizing the importance of conservation. He also offered to Tony the following advice. "Stand for something and fight for what you believe in. If you do, you will make powerful enemies too." Tony married Darlene Repetowski of Bismarck in 1960 with whom he had and reared four children; Cam, Melissa, Alexia and Anthony. Tony always praised Mandan as a great place to grow up in with wonderful outdoor recreation in the area and lots of fine people. In addition to his great success in broadcasting, Tony carried the message of conservation to nation-wide audiences and is a well-known activist in perserving wilderness areas for future generations to enjoy. Tony Dean died of complications after abdominal surgery on October 19, 2008 at the age of 67.